A while back, when I was first becoming interested in nutrition and raw eating, I began looking up the nutritional value of different vegetables. Celery was one that surprised me. I guess I have always thought of celery as sort of a kid's veggie - just something that you throw in soup for no apparent reason or put peanut butter or cream cheese on so that a kid will eat at least some kind of vegetable. Of course I was surprised once I learned the really story. Vitamin C - Celery is actually an excellent source of vitamin C. As we all know, vitamin C helps support the immune system and may help reduce symptoms of the common cold or the severity of cold symptoms. Vitamin C is also known to reduce the severity of inflammatory conditions like asthma, osteoarthritis, and rheumatoid arthritis. Vitamin C is beneficial as it promotes cardiovascular health by fighting free radicals that can oxidize cholesterol and lead to plaques that may rupture causing heart attacks or stroke. Potential blood pressure benefits - Celery's potential for reducing high blood pressure has long been recognized by Chinese medicine practitioners. Celery contains active compounds called phthalides, which can help relax the muscles around arteries and allow those vessels to dilate. With more space inside the arteries, the blood can flow at a lower pressure. Phthalides also reduce stress hormones, one of whose effects is to cause blood vessels to constrict. Reduces cholesterol - In studies of animals specially bred to have high cholesterol, celery's cholesterol-lowering activity has been demonstrated. After only 8 weeks of consuming celery juice, these animals showed significantly lower total cholesterol by increasing bile acid secretion. Good antiseptic - Celery seeds help in uric acid elimination. So, celery is good for people with bladder disorders, kidney problems, cystitis etc. Celery seeds also assist in avoiding urinary tract infection in women. Healthy joints - Celery is good for people suffering from arthritis, rheumatism and gout. Its anti-inflammatory properties help reduce swelling and pain around the joints. Celery sticks contain a diuretic substance, which help to remove uric acid crystals that build around joints. 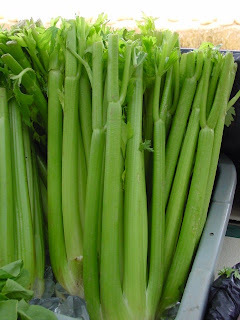 Prevents cancer - Celery contains phthalides and polyacetylenes. These anti-cancer components detoxify carcinogens. Celery also contains coumarins that enhance the activity of certain white blood cells. Diuretic activity - Celery is rich in both sodium and potassium. These minerals help in regulating fluid balance. Relief from migraine - Presence of coumarins gives relief from migraines. Appetite suppressant - For those who are trying to reduce their weight, drink celery juice before meals. It will help to suppress the appetite. Choose celery that looks crisp and snaps easily when pulled apart. It should be relatively tight and compact and not have stalks that splay out. The leaves should be pale to bright green in color and free from yellow or brown patches. To store celery, place it in a sealed container or wrap it in a plastic bag or damp cloth and store it in the refrigerator. If you are storing cut or peeled celery, ensure that it is dry and free from water residue, as this can drain some of its nutrients. Freezing will make celery wilt and should be avoided unless you will be using it in a future cooked recipe. I highly recommend adding celery to your favorite juice recipe. It's high water content makes it ideal and you can drink a lot more celery than you will probably ever eat! Don't forget about our great Terra Firma Cosmetic giveaway! You have until 11:59 pm EST today to enter. I really should eat more celery! It's also very alkalizing to the body, which is of course a good thing!